To view PDF files, you may need the Adobe Acrobat Reader. This publication may contain dated technical, contact, and link information. Cover images courtesy of the Associated Press 2003 (left), © Mylightscapes|Dreamstime.com (center left), the Florida Department of Transportation (center right), and the San Francisco Bay Area Metropolitan Transportation Commission (right). Investments in traffic incident management (TIM) capabilities save lives and reduce congestion. Nationwide, TIM efforts are credited with reducing annual delay by 129.5 million hours with an associated cost savings of $2.5 billion. As part of the Federal Highway Administration's (FHWA's) mission to "Keep America Moving," we strive to support State and local efforts to safeguard the motoring public and those responding to traffic incidents while reducing congestion and traffic delays resulting from an incident on the road. Safe, quick clearance of highway incidents—a foundation of both mature and developing TIM programs—depends on strong, coordinated multi-agency operations. With more vehicles on the Nation's highways, traffic incidents become increasingly more frequent and life threatening to motorists and responders dispatched to help. Since 2003, 59 law enforcement, 12 fire and rescue, and 54 maintenance personnel died after being struck by vehicles along the highway. Moreover, the Towing and Recovery Association of America (TRAA) reports a loss upward of 100 towing operators in the line of service annually (2008). The occurrence of responder injury or "near misses" is much higher. Statistics associated with motorist death and injuries are even more astounding. In a five-year study conducted in North Carolina, 1,300 abandoned vehicles were struck, resulting in 47 fatality crashes and over 500 injuries. In 2005, 500 fatalities were reported nationally as a result of incidents occurring on the roadway shoulder and median. In response, many State and local governments have adopted three types of general legislation constituting Quick Clearance Laws—"Move Over," "Driver Removal," and "Authority Removal"—to support concurrent safe, quick clearance operations. Although a number of States currently have one or more of these laws in place, the legislation varies in scope, wording, coverage, and sanctions. FHWA produced this document to support State and local efforts to improve Quick Clearance Law implementation. 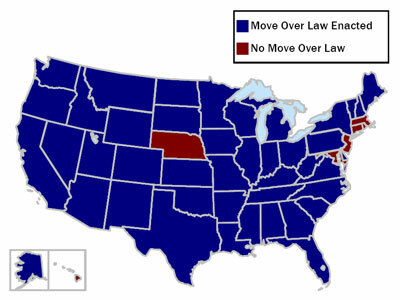 Researchers found that the most successful and consistently enforced Quick Clearance Laws had: (1) carefully crafted statutory language reflecting quick clearance objectives and (2) State encouragement of government and industry partnerships that provide united support for safe, quick clearance objectives and laws. This document supplies States with tools to address arguments against such laws and examples of Move Over, Driver Removal, and Authority Removal laws that work. We hope you find this material helpful in your efforts to understand, establish, or strengthen Quick Clearance Laws. Moreover, we encourage comments and contributions to these primers and other FHWA traffic incident management documents. Please feel free to contact our Emergency Transportation Operations Team at ETO@dot.gov with suggestions for future revisions. FHWA-HOP-09-005 2. Government Accession No. 3. Recipient's Catalog No. Jodi L. Carson, Ph.D., P.E. 8. Performing Organization Report No. Project performed under contract to Battelle for the Federal Highway Administration. Constituting "Quick Clearance Laws," three types of general legislation – Move Over, Driver Removal, and Authority Removal laws - support concurrent Quick Clearance operations intended to enhance motorist and responder safety, as well as reduce congestion and delay. Although a number of States currently have one or more of these laws in place, observed variability in the existence, wording, and coverage of Quick Clearance Laws challenges further implementation. The intent of this investigation was to better support Quick Clearance Law implementation efforts by better preparing States to respond to questions regarding the necessity of Quick Clearance legislation and identifying examples from existing State Move Over, Driver Removal, and Authority Removal legislation that serve to both support and challenge successful incident management operations. Through this investigation, carefully crafted statutory content and language that best support Quick Clearance objectives, and agency/industry partnerships that provide demonstrated, united support for safe, Quick Clearance objectives and related legislation were observed to be key factors supporting implementation of Quick Clearance Laws. This report includes: (1) a description of the role and relevance of Quick Clearance Laws in the broader traffic incident management context; (2) a detailed review of the purpose and intent, model language, observed content trends and anomalies, and implementation challenges and resolutions for Move Over, Driver Removal, and Authority Removal laws including specific examples from State legislation; and (3) concluding remarks and proposed strategies for implementation, including beneficial synergy resulting from combined Quick Clearance Law implementation. The U.S. Department of Transportation provides high-quality information to serve Government, industry, and the public in a manner that promotes public understanding. Standards and policies are used to ensure and maximize the quality, objectivity, utility, and integrity of its information. USDOT periodically reviews quality issues and adjusts its programs and processes to ensure continuous quality improvement. This material is based upon work supported by the Federal Highway Administration under contract number DTFH61-06-D-0007. Any opinions, findings and conclusions or recommendations expressed in this publication are those of the author(s) and do not necessarily reflect the views of the Federal Highway Administration.